ToursByLocals Blog - The Big Island of Hawaii: like nowhere else on earth! The Big Island of Hawaii: like nowhere else on earth! Are you planning a trip to Hawaii in 2014? If you are, make sure you include a trip to the Big Island as part of your itinerary. The Big Island (or “Hawaii” Island) is home to one of the world’s most active volcanoes (Kilauea), the tallest sea mountain in the world (Maunakea), lush rainforest, volcanic deserts and green (!) sand beaches. Our Big Island of Hawaii guide, Scott is here today to give you more reasons to visit his island, including tips for getting off the beaten path. Each of the main islands of Hawaii are unique in their own way, but the Big Island offers the most diversification with over 4,024 square miles to enjoy. From beautiful white, black and green sand beaches to the world’s most active volcano, visitors from all over the world are discovering the amazing offerings found here. Volcanoes National Park (VNP) is located on this island and it sits right next to the village of Volcano. That’s right, there really is a village named Volcano, Hawaii...they even have their own post office. 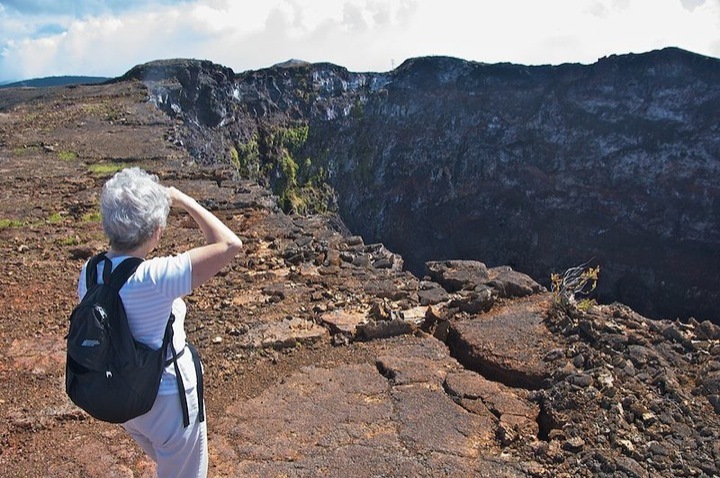 A visit to Volcanoes National Park is an amazing experience that will allow you to see the active Kilauea volcano smoking from Halema’uma’u Crater. If you’re the hiking type, there are numerous trails within VNP, with my favorite going to the actual Kilauea Caldera floor. To think that there are thousands of visitors each day to the park, and you can be the only person standing on the caldera floor. It’s a peaceful experience that simply cannot be described by words. VNP is open 24 hours per day, and this allows visitors to actually see the glow from the lava lake when it’s dark. It really is a moving experience and enjoyed by many of my guests. Punalu’u Black Sand Beach is home to the largest black sand beach on the island where many sea turtles can be found basking in the sun. This is a popular place for locals to come on the weekends for cookouts and playing in the ocean. With swaying coconut trees, peaceful surroundings, smooth black sand...who wouldn’t want to experience this? Waipio Valley is the place where King Kamehameha was raised as a child. This amazing valley is very secluded and offers a wonderful overlook where you can see a huge black sand beach below. There are only a few families living in the valley with some of them still producing taro the traditional way. By the way, the only way to the valley floor is by four wheel drive vehicles (or walking) and is not a drive for the faint of heart. This road is one of the steepest in the United States and is not recommended for inexperienced drivers. Walking the road is a monumental task and will certainly have you asking: “What have I done?” But the reward? Amazing sights, amazing sounds, amazing accomplishment! Hapuna Beach, on the west side of the island, is a fantastic location for boogie boarding, snorkeling, sun bathing, rock jumping and swimming. Being the island’s best white sand beach, it is recommended to visit during the week to avoid the crowds. The Island of Hawaii has many state parks and this is one of the best, providing fresh water showers, picnic areas, lifeguards and clean restrooms. Imagine lounging on the beach with the ocean in front of you and a view of mountains and lava on either side…it really doesn’t get much better than this. Some suggestions I offer travelers: 1) If you’re coming to the Big Island for several days, plan on staying in Hilo half of the time and Kailua-Kona the other half. 2) If coming to the Big Island for a day trip from another island, I would highly recommend flying into and out of the Hilo airport (ITO). The Hilo airport is closer to Volcanoes National Park and many other sights. One final suggestion: hire Scott for a private tour around his favourite spots on the island! This friendly local was one of our top ten busiest guides in 2013. You won’t regret having him show you around!